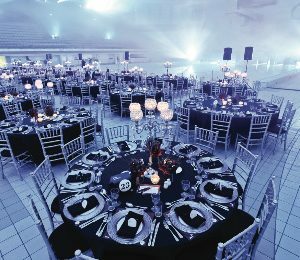 Bowl your guests over with an invite to an exclusive fine food and wine experience under the stars at Sydney Showground Stadium, Sydney Showground. Start the evening with a classic red carpet arrival and have your guests escorted onto the centre of the pitch for drinks and canapés before an elegant dinner featuring award winning food and wine at the grand table on field. 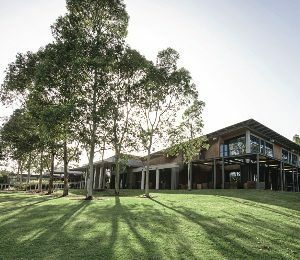 Enhance the activity with a cheese, wine and olive oil tasting station or our ‘Grape to Glass’ team experience with guests learning to blend their own wine under the expert eye of a Hunter Valley Wine Maker. Complete the setting with an acoustic guitarist or musical performance to give your guests a truly unforgettable dining experience. Bon appetit! An authentic ‘Aussie outback’ themed evening complete with whip cracking, wood chopping and sheep shearing under the iconic and grand structure of The Stables at Sydney Showground. Cheer on your favourite and watch in delight these competitive Australian sports. Delegates can even try it for themselves – If they dare! Home to the Sydney Royal Fine Food Awards, the Sydney Showground kitchens offer some of the finest award winning food and wine in the country. Guests will be able to enjoy the exquisite flavours of Australia with menus specially created with your group in mind. A truly Australian gourmet experience. 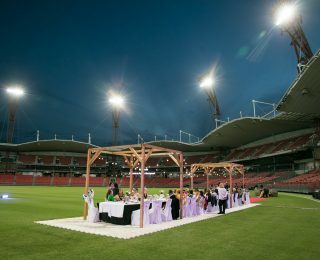 Wow your guests with delectable canapés and cocktails under lights on the playing field at the famous ANZ Stadium. 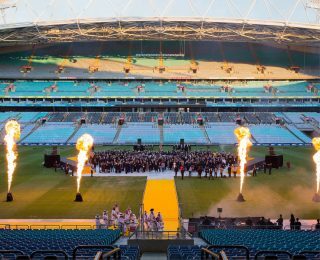 Imagine the roar of 110,000 screaming fans during the Sydney Olympics as they step onto the arena. Home to many a sporting victory and Olympic world record, delegates will be inspired by the magnificence of this 83,000 capacity stadium. Relive great sporting moments displayed on the giant screens or present your own video presentation. A perfect inspiring venue for all sized groups. Bombs Away – Bunker Down! 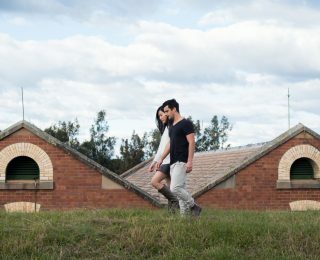 The Newington Armory Gallery, located in Building 18 at the northern end of the Armory, is a former World War II explosives storehouse that was adapted for re-use in 2004. Providing visitors with an insight in to a chapter of Australia’s military history, the building is now a flexible 500sqm exhibition space with a maximum audience capacity of 450 people. The venue is often used for visual art exhibitions, natural history exhibitions and corporate functions providing a unique backdrop for international visitors and history fans alike. Create a most unique occasion for your guests with dinner on the famous Olympic pool deck. Dine on a delicious three course meal or perhaps sip a cocktail or two as guests enjoy an exclusive entertainment line-up. The pool can be transformed into a floating stage for high energy, spectacular water performances, fireworks, jet skis, hovercrafts or even an ice rink. Endless possibilities to create a splash for your delegates. Feel like a tennis professional as you walk through the players’ tunnel onto Centre Court at Sydney Olympic Park’s Tennis Centre. But the only things served on this occasion are cocktails and canapés! 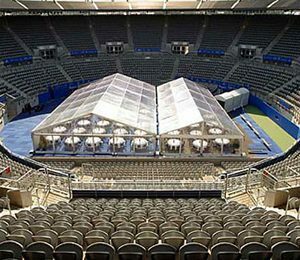 Home to the annual Sydney International Tennis Tournament, the famous Centre Court can be transformed to an elegant cocktail party space surrounded by twinkling lights and the sounds of a rhythmic jazz band. 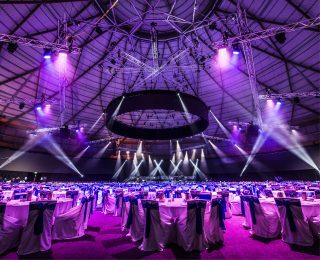 The Sydney Showground’s grand Dome, a spectacular timber structure and the largest of its kind in the Southern Hemisphere is a fabulous backdrop for any event and is the largest clear span event space in Sydney. Roll out the red carpet for your delegates and host an elegant corporate cocktail party for 500 or a stunning gala dinner 4000. Home to the Sydney Royal Fine Food Awards, the Sydney Showground kitchens offer some of the best award winning food and wine in the country. A truly Australian gourmet experience and iconic venue. 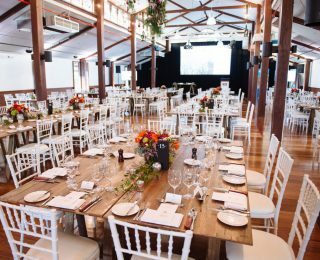 Set amongst the picturesque backdrop of leafy Bicentennial Park, Waterview is a modern, purpose-built venue catering for all sizes and styles of business events – including daytime and evening functions from 30 up to 1500 people. From lunches to dinners and conferences to high-tea, Waterview’s parkland setting is a delightful option for your delegates.